Eileen Austin, left, from the First National Bank and Trust Company of Newtown, helps seventh-grade student teller Georgia O’Connor conduct a transaction for third graders Olivia Nace and Kristina Murray at St. Andrew School in Newtown. A class of wiggling, chattering kindergarteners were silenced in curiosity as they watched their teacher talk to a bank teller about opening up an account to save for a new bicycle. Patty Price, a teacher at St. Andrew School in Newtown, animatedly explained to the little learners what she was doing at this student-operated branch of the First National Bank and Trust Company of Newtown, located right in the school. Overseen by professional tellers, the St. Andrew’s branch offers savings accounts and withdrawals of up to $50 per student a day. 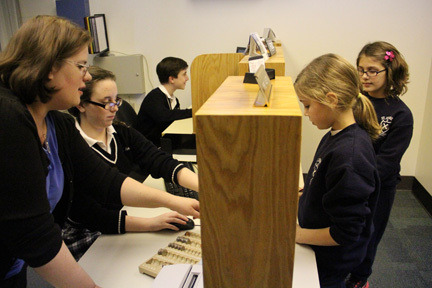 Seventh- and eighth-grade volunteer student tellers complete bank transactions for participating students and families of the current St. Andrew School community. Since its inception in October, the branch has opened approximately 70 new student or family accounts as well as provided the students with real-life experience for developing financial literacy, economics and mathematics skills. Sitting in a booth equipped with a computer and desk, Nick Tentilucci, one of the 20 student volunteers who successfully passed a rigorous application and interview process to become a teller, observed a fellow classmate open a new account for a younger student. The branch looks modern and real, but miniaturized to fit in the small space near the entrance of the school. Tentilucci said that in addition to helping with money-counting skills, the bank has been discussed in social studies “as way to show that banking has modernized from the printing press to this technology.” The student tellers use computers and banking software to make transactions. Rick Rosenblatt, St. Andrew vice principal who initiated the program, said, “I wish I knew half of this stuff” about saving and deposits as a student. While most parents go to the bank without their children or do all their banking online, he said having a bank at school is a concrete way to teach financial literacy. Rosenblatt noted that a stock market club is in the works to further illustrate to students how the economy functions. In a letter posted on the school web site, Principal Nancy Matteo said the school is adopting a curriculum created by the American Bankers Association Education Foundation, which will incorporate financial literacy lessons for kindergarten to eighth grade students in addition to math and social studies lessons. “Students learn better when they see real-world application,” said Jennifer Drayer-McDonald, development director of the school. In addition to making financial transactions for clients, the student tellers went through the same application and training process as paid bank tellers, she said. Drayer-McDonald added the student bank tellers are gaining professional experience while working at the bank. Eighth-grade student Joe Braun, as well as several other student tellers who spoke to The Catholic Standard and Times in early January, said they have enjoyed the opportunity to work at the bank. They volunteer on a rotational basis to ensure that students do not consistently miss the same class. “It’s a great experience for kids. It’s not every day that a kid can be a bank teller at a school,” Braun said. Emma Jennings, another eighth-grade teller, noted the volunteers’ responsibilities. Student tellers “have policies that we have to follow. We cannot say anything about anybody’s accounts,” she said. Since St. Andrew School has held its accounts with The First National Bank and Trust of Newtown since its opening in 1927, the bank was “a natural choice to partner with us in this endeavor,” Drayer-McDonald said. Regina Lordan is a freelance writer and a member of St. Andrew Parish in Newtown.